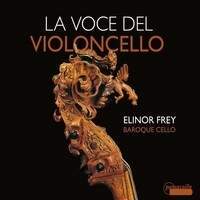 “First Italian cellist-composers” is pushing matters just a bit, given that, as Elinor Frey mentions, her recording spans roughly 75 years of music. It concludes with Giuseppe Maria Dall’Abaco, who was born in 1710 and died in 1805. But suffice to say, the disc furnishes an entertaining and varied program that features ricercars (Gabrielli), folk-like dances (Ruvo), bravura variations over ostinato basses (Vitali), Corelli-influenced sonatas (Galli), and a study in demonic virtuosity (Supriani). Most of the 22 selections are solos, though three selections are accompanied by theorbo, one by Baroque guitar, and two with continuo furnished by theorbo and a second baroque cello. The Baroque cello Frey uses isn’t identified in her notes, though she writes sensibly of the different tunings she uses that were employed by composers in different geographical areas, and the underhand bow grip she’s adopted for the earlier music thanks to period depictions of cello performance. The instrument itself sounds like a good period copy: exceptionally resonant, very dark and smooth in coloration. In live performance the Baroque cello wouldn’t have the sheer penetrative volume to rise above a chamber orchestra, much less a full 20th-century one. On a record, of course, you have all the volume you want, and combined with her carefully accented phrasing, a repertoire of seldom heard music, gloriously interpreted, springs to life. Frey is clearly a performer who enjoys the music she plays, and communicates that enthusiasm to her audience well. I have one regret where this album is concerned. The variation sets over ostinato basses are very short, and in the fashion of such music, gather their own energy through repetition and transformation; but here, they seem to end almost before they’ve begun. It was the custom yet in the period that musicians would be expected in some works to furnish their own additional variations (and ornaments) beyond those supplied by the composer; and Vitali’s three pieces on this disc call out for this treatment. Given the disc’s length, it needn’t even have interfered with what is already present, and Frey could have repeated these pieces, with her own additions, on separate bands. But that is a relatively small cavil. The music never fails to entertain, and Frey’s playing never fails to delight. Strongly recommended.